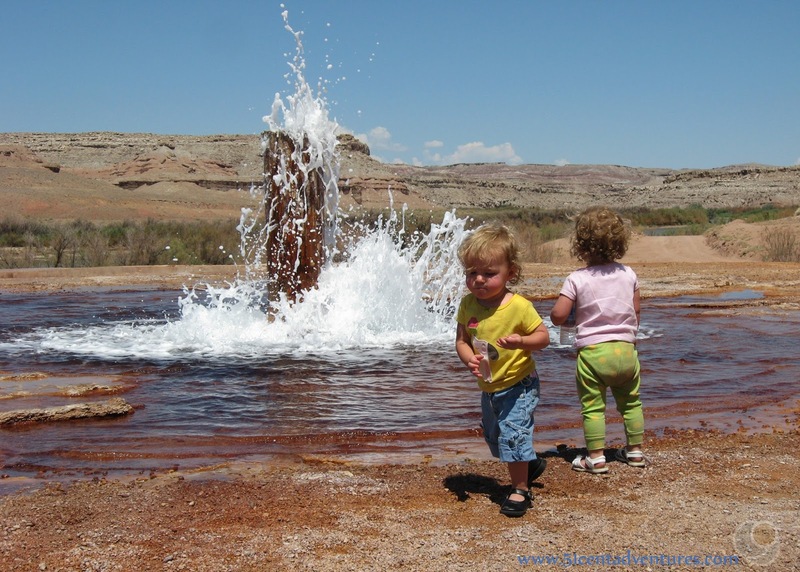 Description: Southern Utah is full of unexpected features, but perhaps the most unexpected feature of all is Crystal Geyser. 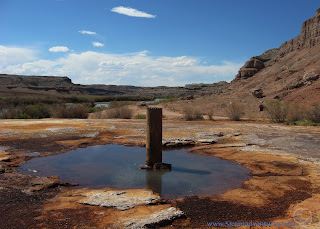 This is a cold water geyser located on the banks of the Green River just a few miles south of the town of Green River. 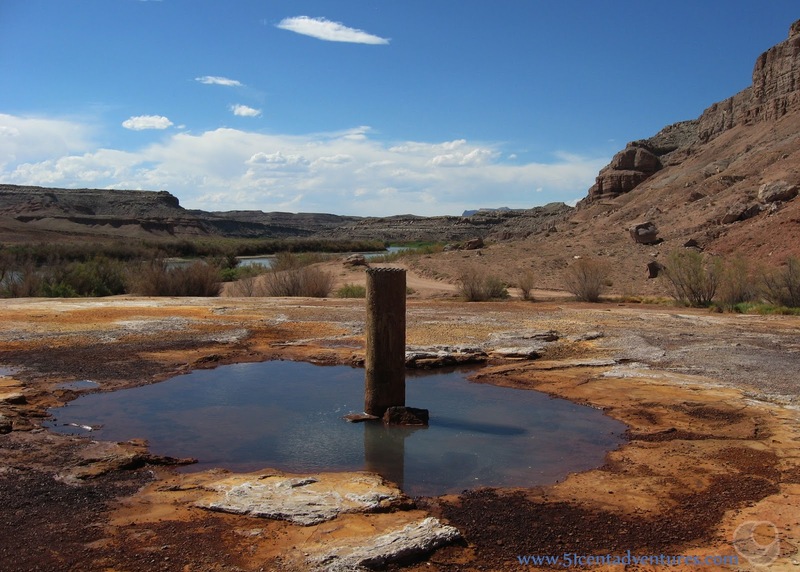 Location: The geyser is located along Little Valley Road less than 10 miles south of the town of Green River. Detailed directions are included at the bottom of this post. Operating Seasons and Hours: The area is accessible at all times. 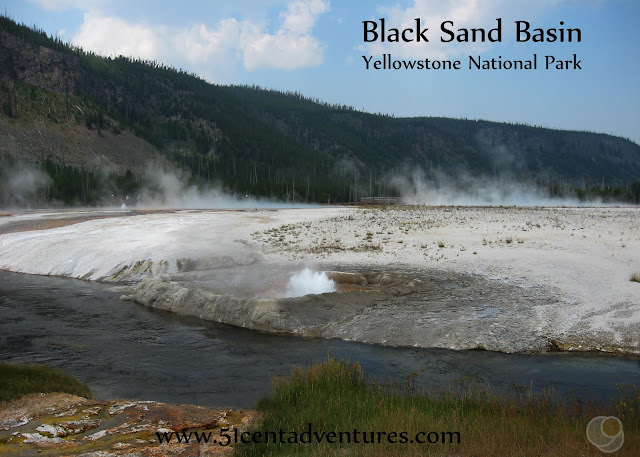 The geyser is said to erupt about twice a day, but it is not on a very precise schedule. My husband and I actually discovered Crystal Geyser during our Colorado Road Trip in 2012. It was one of our first stops as well as our last stop on that trip. 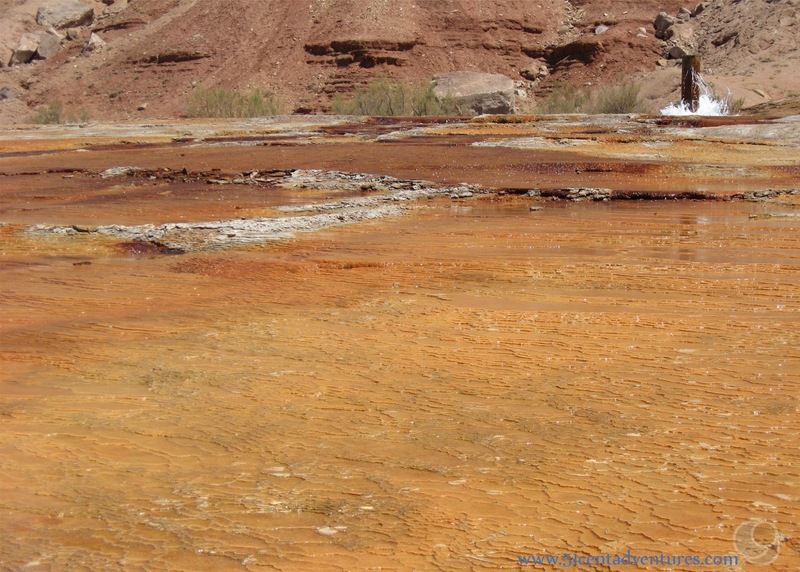 However, since the geyser is located near Moab, Utah I'm including it as part of the alternate route for my Southern Utah Road trip series. 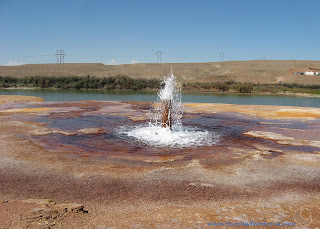 If we had known about the geyser during our Southern Utah Road trip in 2010 we might have reworked our route and visited the geyser instead of driving on the Upper Colorado River Scenic Byway. In June of 2012 my husband and I were able to take a trip to Moab, Utah for a river rafting day trip on the Colorado River with my husband's co-workers. This weekend was a big deal for us because it was a chance to take a break from the pressures of being parents to three very young children. As we traveled from Bountiful to Moab we took advantage of the fact that we weren't travelling with little children. We stopped at points of interest and took little detours every chance we got. One of the places we stopped was a rest-stop on Highway 6 somewhere between Spanish Fork and Helper. The rest-stop was pretty interesting in its own right because it was shaped like a train yard. Inside the building we found a stand with brochures of things to do around Price and Green River. Some of the things looked interesting so I grabbed a handful of brochures, and we were on our way. One of the brochures was for a short day trip to Crystal Geyser near Green River. Both my husband and I couldn't believe that there was a geyser in the middle of Utah. We only associated geysers with Yellowstone. We decided we had to check it out. My husband said, "we'd be stupid not to." Green River was on our route to Moab anyway, so we didn't have to detour too far to find the route to the geyser. The brochure had good directions printed on it, and along the road there were several crude signs set up to help us on our way. Crystal Geyser is located on what used to be the White Sands Missile Range. The whole area is remote and desolate. We went through terrain that the brochure described as "interesting and varied landscape." At first I thought that was code for "boring," but it did turn out to be interesting and varied. After about 7 miles the road led to an area with a pipe sticking out of the ground. We were pretty certain that this was the spot for the geyser. According to the brochure, Crystal Geyser erupted twice a day. It also said the eruptions could go as high as 60 feet. That sounded pretty impressive, so we hung around for about 45 minutes hoping to see an eruption. 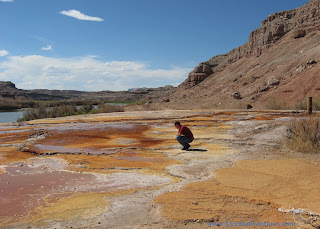 While we waited we checked out the travertine rock formations that have been created by the geyser run off. We also went wading in the Green River. The geyser didn't go off while we were there, but we decided that the area had been worth the detour. 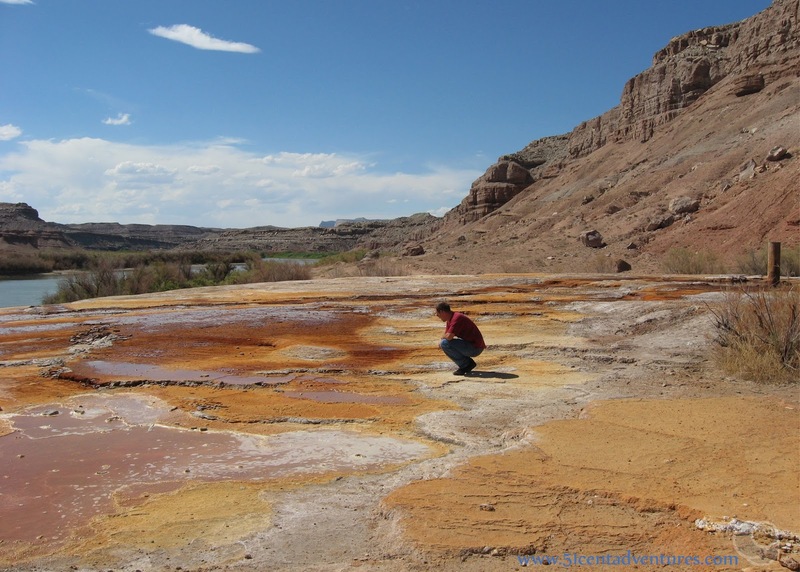 We'd seen evidence of a geyser in Utah, and that was pretty cool. At the end of our roadtrip, our original plan had been to drive all the way back from Colorado Springs to Bountiful in one day. We figured the kids would eventually fall asleep, and it would be easier to drive late into the night rather than stop somewhere along the way. Plus we'd never been able to think of a very good place to stop for the night. But my husband proposed a new plan the night before we left Colorado Springs. "What do you think about going back to Crystal Geyser in Green River and camping there on Saturday night?" He asked. I was a little unsure about the idea. I wasn't sure if we could camp there. I was worried that we'd get the tent all set up with the kids in bed only to have some sheriff show up and kick us out. But my husband dug out the Crystal Geyser brochure again. It had a little tent icon on it and so we figured camping was allowed. Camping at Crystal Geyser was added to the vacation itinerary. Since we'd shortened our drive by 4 hours we took our time along I-70 the next day. We didn't arrive in Green River until after dark. I was glad that we'd already been to the geyser in the day light so we at least sort of knew what to expect from the road to the geyser. When we arrived at the geyser area we could see a camp fire from some other campers so we knew that it was okay to camp there. There weren't designated camping spaces or any sort of facilities so we just found a somewhat flat spot in a little gully and set up the tent. Things got a little dicey when the wind was blowing strongly and the kids were crying, but everything settled down after a few hectic minutes. The kids fell asleep and my husband and I went to check on the geyser. We heard it making gurgling noises. We shined the flashlight on it. There was some water splashing around the base, but no eruption. We decided that we had a pretty good chance of seeing the geyser erupt while we were there. We went to bed hoping to see an eruption when we woke up the next morning. In the morning we decided to hang around the area for as long as possible to see if we could see an eruption. We played with our kids in the mud on the banks of the Green River, and had a lot fun doing that. Then we all got tired so we headed back to the tent for naps. I unzipped all the windows so the air would be cooler. The girls were asleep within seconds. Even my husband and I laid down and were almost asleep. But suddenly we heard shouts from the other campers. "What could they be shouting about," I wondered. And then my husband sat up and said, "The geyser!" We hurried out and saw this. The other campers were playing in the water. One of them filled us in on the history of the geyser. He said that the geyser was created over 80 years ago when people were drilling in this area for oil. They hit a carbon dioxide pocket, and the geyser has been erupting ever since. It is a cold water geyser powered by carbon dioxide. It functions a lot like a soda pop bottle does when it's been shaken up. When the pressure gets too high it erupts. 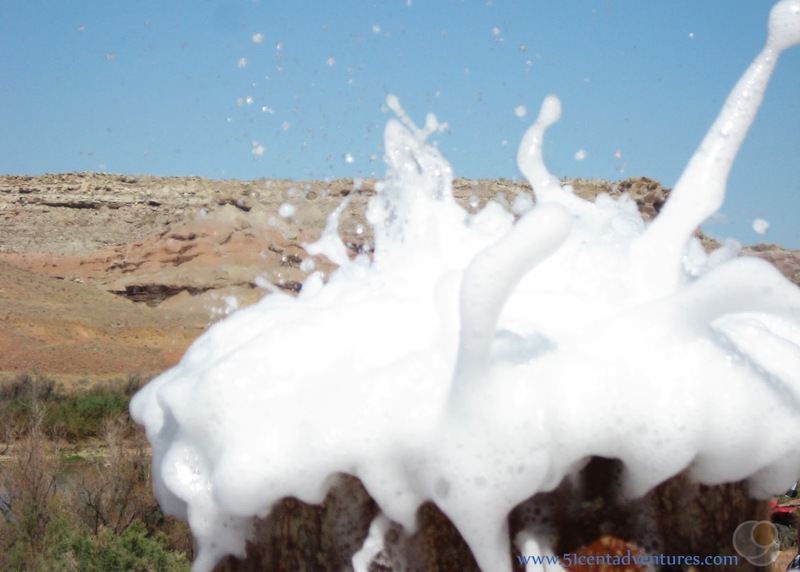 The white foam that the geyser creates has earned it the nick-name "Soda Pop Geyser." Our kids woke up from their naps, and we brought them out of the tent so they could see the geyser. Since the water was cold we didn't have to worry about them getting too close to the water. In fact, the twins played in the water for a long time. Our trusty brochure said that the geyser could erupt as high as 60 feet, but that 30 feet was more common. However, the highest we saw it erupt was probably 10 feet - if that. Apparently many people have been putting rocks down inside the geyser pipe. Those rocks are creating a blockage that makes the eruptions a lot less intense. Still it was very cool to see the water spurting out. 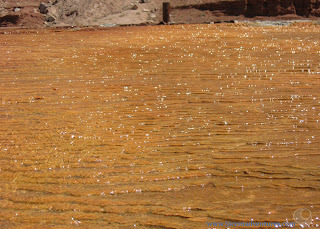 The water ran off from the geyser and spread out as it ran down to the green river. 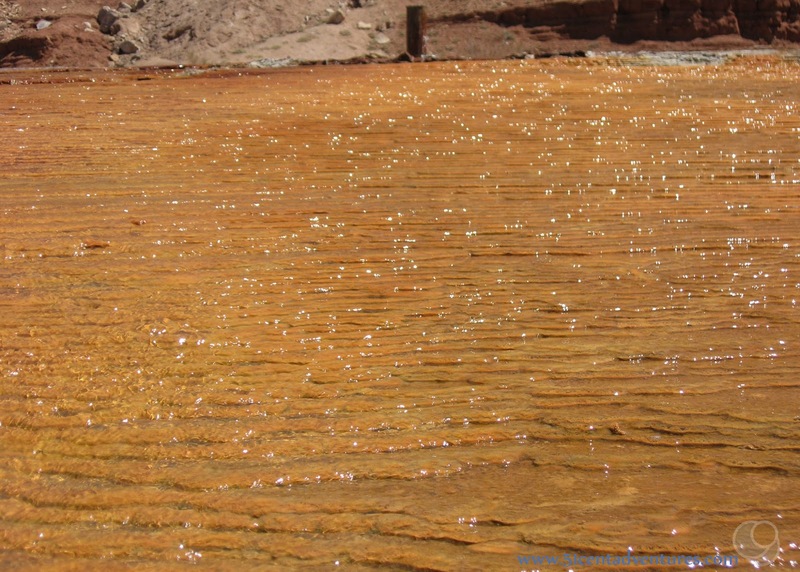 The water on the travertine rocks was so pretty. Eventually the geyser stopped sputtering and the water stopped flowing. We decided that this had been one of the strangest and most unique things we'd ever done. It was also one of our favorite vacation memories. 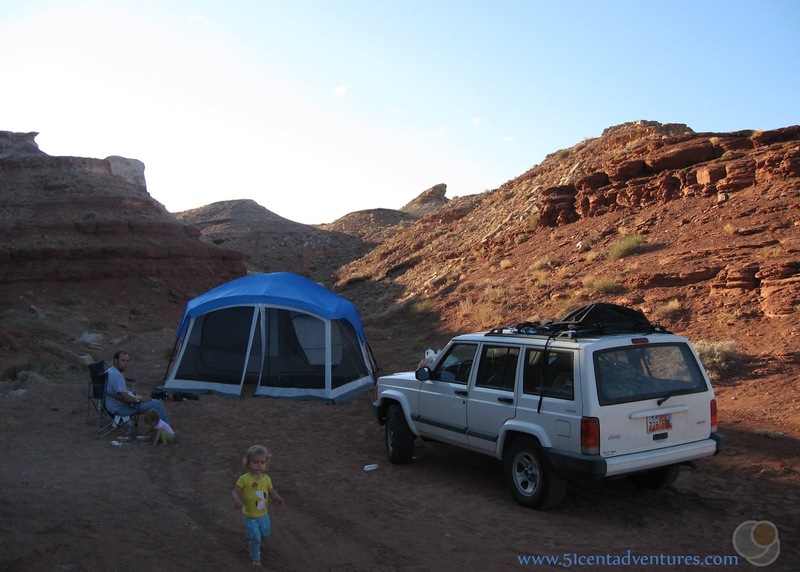 Even now, three years later, I still can't believe that we saw a geyser erupt in the middle of Utah - or that we camped just a few yards from it. I'm so glad that my husband and I decided to take a little detour to discover something completely new. Recommendation: If you are travelling through Green River, Utah then a trip to Crystal Geyser is definitely worth your time. The geyser is only about 20 minutes away from I-70. This is one of those things that you almost have to see to believe. 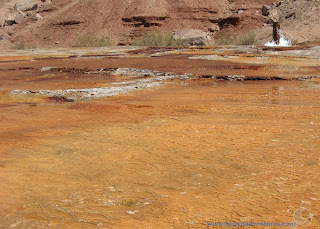 And even if you aren't able to see an eruption, the travertine formations are very interesting evidence of the geyser. Directions: If you are on I-70 take Exit 164 and turn south onto Main Street. (That's the direction headed AWAY from town.) Main Street ends almost as soon as it crosses over I-70. Turn left onto the frontage road. The road is called BLM 325 or New Area 51 Road, but I'm not sure there is a road name sign. After about 2 miles turn right onto Crystal Geyser Safari Route. (Again I'm not sure if there is a road name sign, but this is your only option to turn right.) This road is a graded dirt road. Most cars should do fine on this road when it is dry. Your going to go up and down some hills for the next several miles. There will be a road that goes off to your right. Don't turn there. Instead pass under the power lines and continue following the road as it curves right. The road will head west toward the Green River. Additional Information: As I mentioned earlier in this post, the geyser's eruptions were considerably smaller than we expected. That has continued to be the case, and it's most likely due to tourists putting rocks inside the pipe. 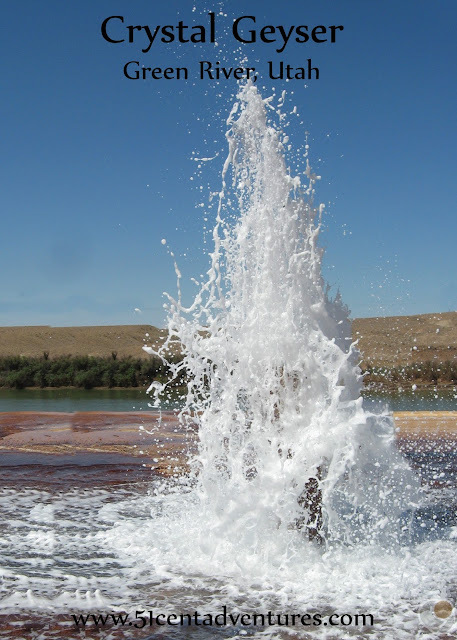 In April of 2014 KSL.com published an article about Crystal Geyser where they discuss a little bit of the geyser's history, and what some people are hoping to do to bring back large eruptions. Places Nearby: The stack of brochures I grabbed at the rest stop contained several options for day trips near Green River. Visit destinationgreenriver.com for all the travel options in that area. 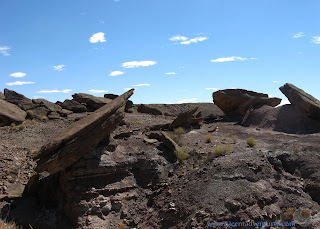 If we hadn't decided to go to Crystal Geyser my husband and I might have chosen to look for dinosaur bones at Fossil Point, or looked at petroglyphs in the Lower Gray Canyon. Next Stop: Black Dragon Canyon which is another place we discovered during our weekend getaway to Moab.